So you’re going to visit the City of Brotherly Love? Awesome! It’s your first trip, and you want to make sure you hit all the hot spots. With so much history and culture in a small area, you are bound to have a schedule packed with exciting sites. If you are trying to get to all the must-see attractions around the city, we’ve put together the following list of fun things to do in Philadelphia to help you out. If you’re worried about getting around to said attractions in the city, you have a few travel options. One of the best things about Philadelphia is the grid system. It’s super easy to navigate, and from there, you can walk to most of the attractions on this list. You can also choose to hop on a trolley (check out number eight below). If you are looking for something a little different, then rent a bike at one site and drop it off at the next. This bike-borrowing trend is becoming one of the coolest ways to explore major cities these days. No matter what way you choose to explore the city, what matters is that you visit the top spots. This handy-dandy list we’ve put together gives you a selection of the absolute “can’t miss attractions” and best things to do in Philadelphia. One of the best parts is that most of the attractions on our list are either free or fairly inexpensive, so the trip won’t force you to take out a second mortgage. Enjoy more seeing with less planning and fretting. Our top 10 picks won’t disappoint! This is the first on our list for things to do in Philadelphia. Philadelphia is, and will always be, the place where the forefathers of our country came together and declared our freedom from the tyranny of British empirical rule by drafting and signing the Declaration of Independence. Then, just a decade later, many of those same people reconvened for the Constitutional Convention to set forth the basic fundamental rights of all American citizens in the Constitution and Bill of Rights. The two most important documents were drafted and signed in Independence Hall, Philadelphia. A tour of this building will get your patriotic pride pumped up. Not too far from Independence Hall, you’ll find the little bell that could. The Liberty Bell has a long and interesting history. Originally cast in England, the bell purportedly cracked the first time it was ever used. A second bell was then cast, and that too cracked. Taking a peek at this legendary American icon and symbol of freedom is a definite must while in Philadelphia. In fact, visiting the Liberty Bell is free. Although never president, Benjamin Franklin was one of the founding fathers of the United States. He was a patriot and inventor who had a brilliant scientific mind. While his family had many homes throughout New England, and even one in London, it was Philadelphia where Franklin was said to have had many of his scientific breakthroughs (lightning rod, anyone? ), and formed his social reformation ideals. At the Benjamin Franklin Museum, you will be able to check out some of his inventions and writings for yourself in the area where his Philadelphia home once stood. Whether you’re a fan of Rocky or you’ve just seen the iconic clip of him running up all those steps, you don’t want to miss having your very own Rocky experience. The steps of the Philadelphia Museum of Art are some of the most photographed and well-recognized steps because of it. The prizefighter with the big heart and the can-do attitude conquered those steps and raised his arms in victory once he did. You can stand next to the statue of Rocky after making your climb and raise your arms right alongside him. You may even want to venture into the museum when you’re done with your list of things to do in Philadelphia. It’s got a great collection. What’s not to love in a city known for “brotherly love”? Love Park, or John F. Kennedy Plaza, is located in Center City, Philadelphia, right across from City Hall. It was created in the 1960’s to cover an underground parking garage. There is a single fountain in the middle which is often dyed different colors throughout the year to commemorate special events or tributes, such as pink for Breast Cancer Awareness Month and blue to commemorate fallen police officers. However, it’s the replica of the Love sculpture created by Robert Indiana for the Bicentennial celebration in 1976 that is the real focal point. Take a few pictures with the iconic sculpture and be sure to get City Hall in the background. If you like science and hands-on learning, the Franklin Institute is a must-see for you. Even though it is billed as a hands-on children’s museum, don’t think for a minute you won’t have a blast. They have exhibits where you can walk through a life-size replica of a human heart or take a peek inside the brain. Or you can check out the stars during shows at the Fels Planetarium and enjoy evening telescope-viewing opportunities. The Franklin Institute is one of the oldest science and education museums in the United States. At the time of this writing, there is a temporary exhibit all about video games, including the whirlwind phenomenon Minecraft. Sensory overload happens daily at Reading Terminal Market. There is so much to take in between the bright neon lights, colorful signs hanging from the rafters, and the food. It is wall to wall food, both the kind you can take home and prepare yourself (ala Farmer’s Market style) and the kind you can chow down on right there in the aisle. The variety is unparalleled anywhere else in the city. Wander around the Reading Terminal Market for just a few minutes and be introduced to food products and unique culinary experiences you can’t find anywhere else. With all this good food under one roof, you better wear your stretchy pants! You may not understand what the Philly Phlash is by the name alone, but it is one of the best ways to take in all the sites of the city. It’s a trolley system that services the downtown historic district and allows riders to see all 22 historical stops in one continuous loop. You can hop on at Independence Hall and hop off at Friendship Park for example. This mode of transport is a great option if you have limited time to see and hit all the high points of the city. The tour guides are filled with educational knowledge about the sites along the tour, and yes, some of them even interject a little color and humor into the experience. It’s a must-ride for those who want to get the most attractions in on one trip. In fact, no trip to Philadelphia is complete without that culinary sensation the cheesesteak. Moreover, if you’ve never had the pleasure of biting into one, you will have plenty of chances on your trip. The sandwich is made of thinly sliced ribeye warmed and served on a crusty roll. Cheez Whiz is the traditional topping of choice in Philly and is considered the only kind of cheese by true cheesesteak lovers. Additionally, you can also add onions, pickles, and other toppings if you want to ramp it up a bit. There is no shortage of places to snag a cheesesteak in Philadelphia, including cafes, food trucks, and even some higher-end restaurants. At the end of a busy day of visiting and doing all things to do in Philadelphia has to offer you may want to kick back and relax. Why not do so at one of the best urban beaches in the country? Spruce Street Harbor Park is a mecca for those looking to relax, wind down and perhaps even catch a nap. The park is situated on the banks of the Delaware River and is home to, among other things, hammocks, a floating beer garden, and at night it is lit up with thousands of brightly colored LEDs. There is even open space to enjoy a picnic and unwind. Again, there are so many things to do in Philadelphia that whatever you decide to do, you really can’t go wrong. 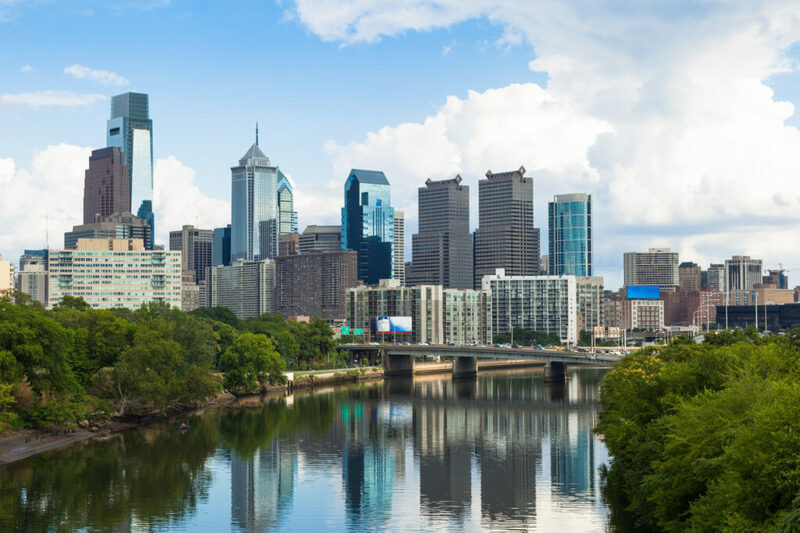 Hitting on the 10 fun things to do in Philadelphia will undoubtedly ensure you have the best visit to the city that our freedom and country were built upon. However, be aware that there are many more fun and educational things to do in the city and the areas surrounding it. Moreover, the more time you have to take it all in, the better; however, the 10 items above can be done in two days or less depending on the amount of time you want to spend at each attraction. Things like the Liberty Bell and Love Park are photo-taking opportunities so you can spend more time in the Franklin Museum or Independence Hall. The point is, the choice is yours on how quickly you get through this list. Lastly, the critical part in all of it is that you enjoy yourself and take in all you can in this historically paramount city.